Wisconsin’s Frank Kaminsky shoots during a Dec. 3, 2014, game between the Badgers and the Duke Blue Devils. The teams face off again Monday night for the 2015 NCAA tournament championship. 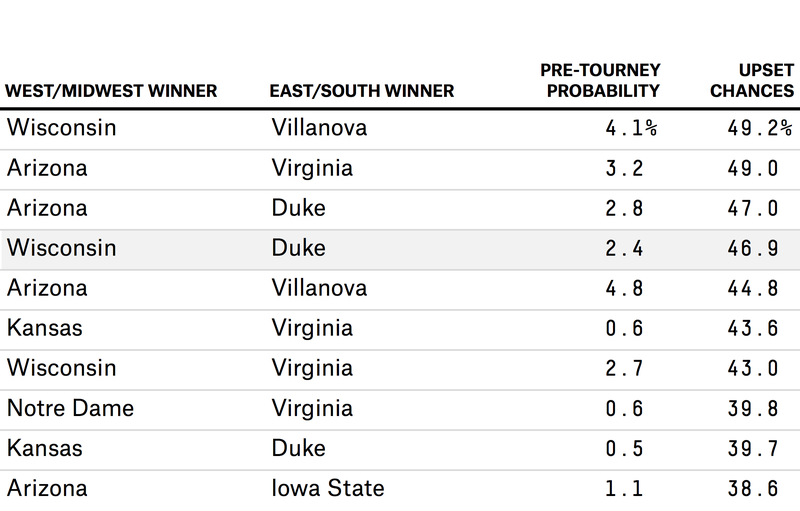 So it looks like Kentucky is the odds-on favorite … oh, wait. Time to rework that lead! Instead of being 71 percent likely to beat Duke and win the NCAA tournament (as our model would have predicted had Wisconsin not short-circuited Kentucky’s offense down the stretch Saturday night), the formerly undefeated Wildcats are nowhere to be found. And after a season largely spent pondering just how heavily Kentucky should be favored, it will instead be either Wisconsin or Duke hoisting the John Wooden trophy on Monday night. It shouldn’t come as a complete shock, but it’s still strange to be talking about the championship of the 2014-15 college basketball season without Kentucky being involved. Meanwhile, each of the 10 least competitive title-game combinations involved Kentucky. So if you were looking for a high-quality championship matchup with no clear favorite, it’s hard to do better than Monday’s Duke-Wisconsin showdown. Both title-game combatants have elite tempo-free offenses, to say the least. Wisconsin led all Division I teams in Ken Pomeroy’s adjusted offensive efficiency metric (paywall), while Duke ranked third. Although both attacks are outstanding, there are a few stylistic differences between the two: Wisconsin operates at a much slower pace and is slightly more reliant on post-ups and 3-point shooting, while Duke looks to push the ball more in transition. But both teams saw about 28 percent of their offensive possessions end in the hands of their respective centers, Kaminsky and Okafor, a pair of low-post scoring machines that may well have been the two best players (paywall) in all of college basketball this season. When it comes to offensive execution, though, the Badgers are simply on a different plane than the rest of the NCAA. The difference between Wisconsin’s top-ranked offensive rating and that of No. 3 Duke was the same as the difference between Duke and 13th-ranked Murray State. And the particulars of this matchup may tilt things even further in Wisconsin’s favor. Between Kaminsky, Nigel Hayes and Sam Dekker, the Badgers had the nation’s third-most-efficient post-up offense and its top isolation attack (by far), according to Synergy Sports. Meanwhile, Okafor’s defensive stats in the post were below average, and Duke’s biggest defensive weakness is against — you guessed it — isolation plays. All is not lost for the Blue Devils, however. The Badgers are more experienced and possess the bigger front line, but Duke was better defensively during the season. While both teams excel at keeping opponents off of the free-throw line, the Blue Devils are much better at forcing turnovers and defending against 3-pointers. In the battle of stars, Kaminsky has better individual defensive numbers1 than Okafor, but Duke owns the edge in perimeter defense, particularly against pick-and-rolls. Statistically, Duke’s defensive advantage isn’t quite enough to cancel out the Badgers’ superior offense, but this is still an extremely close matchup. We have Wisconsin favored by about 1.0 point. Similarly, Pomeroy’s system predicts a narrow 70-69 Wisconsin win, and the consensus betting line also has the Badgers as 1-point favorites. Such a tight predicted margin doesn’t always lead to a close, exciting game — but a barnburner is probably more likely in this matchup than it would have been had either Kentucky or Michigan State prevailed Saturday instead. According to Synergy (paywall) and defensive box plus-minus.